Hi Lollar fans! We sometimes get requests to verify the authenticity of Lollar pickups, whether its a set that pops up on eBay, or a used guitar that is said to be stocked with our stuff. 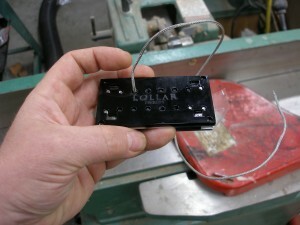 Sometime in 2003 or 2004 we standardized how our pickups were marked, and it is still done the same today. 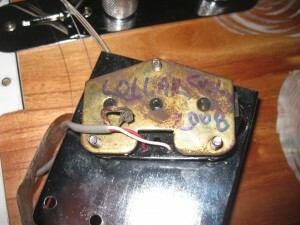 The only way to know for sure that you have a genuine Lollar pickup is to check the bottom and look for the proper markings. We label them in a few different ways, from humbuckers to Strats… there are certain things to look for to insure authenticity. 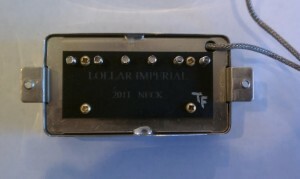 HUMBUCKERS: All our humbuckers have tags screwed to the bottom and are stamped with “LOLLAR IMPERIAL” followed by the year, and if it is a neck or a bridge. Color is important as well… a black label is standard wind, grey is a Low Wind, and red is a High Wind. The name of the builder will be initialed in the right bottom corner. STRATS AND TELES: All of our Strat and Tele style pickups have this info hand written on the bottom: Lollar, the type of pickup (position if it’s a Strat), initials of the builder, and the year it was produced. LOLLAR is also stamped on the top middle on Strats. 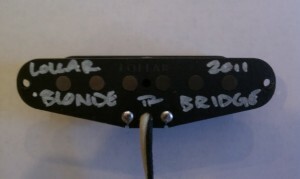 We use either white or black paint pens to handwrite on our pickups. A few models like Thunderbird and Johnny Smith pickups have black baked on enamel that we apply with a laser. P90s: On our P90 pickups, all the info is stamped like a humbucker, except for our Special winds which are indicated by a hand written label, such as 50’s, -5% or +5%. Same for soapbar or dog ear. Besides the markings, our overall construction is top notch. If the pickup seems a bit off- not as solid as it should be, it might not be a Lollar. For instance, wax is usually completely wiped off after potting leaving little to no trace, instead of drippy gooey globs all over. We also buff any exposed forbon (like on Tele bridge pickups) so it has a satin sheen instead of dull, matte type finish. 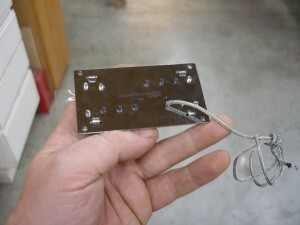 Our lead wires on single-coil pickups lay flat, and there are no frays in the cloth wiring. We also tape all of our coils to protect them from damage. We even buff our plastic pickup covers! 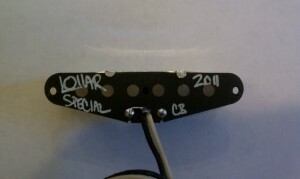 Our humbuckers come with clear plastic tape over the top to protect the finish on the pickup cover. We only use high quality lead wires. If it says Custom on the bottom (along with Lollar and the date) it could be anything- it may not be in phase with anything else we make and it may not match any specs. If you know the name of who originally purchased the custom item we can usually look the job up and see what the specifications were. Occasionally we get asked questions about pickups for sale on eBay that are supposedly Lollar made. It is rare for people to try to pass off fake, uninstalled pickups for Lollars, but here are a couple photos of horribly made pickups that have Lollar written on the bottom. Going as far back as I can remember (before ’96 or ‘97) the bobbins could have been made out of anything other than vulcanized fiberboard – maybe wood, or often I would make them out of the thin plastic that cassette tape cases were made of- these would be fairly roughly made and would have no markings. After ‘96 or ‘97 I would have made my bobbins out of vulcanized fiberboard- this is the same material Fender makes their pickups out of. The quality of construction would be quite high, as all of my parts were cut by hand using jigs – everything would be uniform, but nothing would be signed yet unless someone asked me to. You can tell if a P-90 is mine because I have always made the bobbins by hand and after ‘96 or ‘97 they would be made of vulcanized fiberboard. After my book came out I started to see a few other manufacturers making P-90s using the plan I drew up- vulcanized fiber assembled bobbins. The only time I might use the standard cast plastic bobbin on P-90s would be to restore and old Gibson P-90 that had bobbin rot beyond repair. Sometime around ‘98 or ‘99 I would have started to write model names on the bottom of pickups and dating them- still no signature unless asked for it. If the pickup in question has a model name that corresponds to something I still make then the specs are the same- same magnets and turn count. If you bought a pickup in 1996 and you buy another one today to match with the old pickup, the new pickup will be in phase with the old one- I never changed that. Also, if you have an old single coil neck pickup (like a P-90) and you buy a new bridge pickup, not only will it be in phase but the set will be hum cancelling. Around 2001 or 2002 most of my pickups had established model names, and you’ll see the model name either abbreviated or written out on the bottom- usually in paint pen along with the date and my initials or last name. If all else fails and you are still not sure, take a picture of the bottom and send it to info@lollarguitars.com and we’ll take a look for you. Today is your Lucky Day! 3 steels with Orville Johnson! Would you like your Lollar pickups on the veranda? 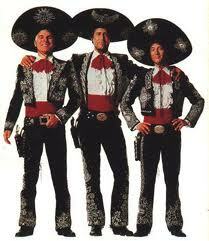 ¡Hola amigos! Today’s installment of Orville Johnson goodness features all 3 of Jason’s lap steel pickups, played clean and clear through a vintage Princeton. Complete with side by side comparisons, it’s a great way to find the version that is right for you. As always, if you have any questions or comments, please let us know! Jason Lollar’s Supro Repro and Orville Johnson’s hot licks! What could be better? I have been using a very cheaply made lap steel that is available from several sources- you’ll see them on online music stores and eBay. The last two I bought were labeled “Rogue” and these came with screw on adjustable legs- I really like to have the legs as my first real non pedal steel was a 50’s Fender Stringmaster 8 string triple neck. I got these from Musician’s Friend for around $80 each including a heavy duty soft shell case, the oldest one I have was labeled “Artisan” and it came with no legs but at any rate I extensively modified the guitars. The most important thing I did was I replaced the nut and bridge and I converted the guitars to a string through body like an old Telecaster. These cheap little lap steels make a useable rig if you take the time to set them up right and put a good pickup and electronics in them. If you can’t do this work yourself I suggest patronizing one of the many fine lap steel builders working in the USA today many of which offer my pickups as standard fare and are listed on my website. The quality of lap steels being made today by these small businesses can not be equaled or surpassed by these cheap import models and they often exceed the quality of the finest vintage instruments. These lap steels originally come with a narrower spaced nut and bridge (the bridge is a standard guitar bridge which is too narrow). Wider string spacing makes bar slants and finger pickup much easier. For slanting the bar (a sort of advanced technique) wider string spacing makes it easier to play in tune and the wider string spacing makes it easier to bend strings behind the bar to get pedal steel type sounds. Look at the photos and you’ll see I just used some angle iron and I made a nut and bridge about 9/16″ tall. 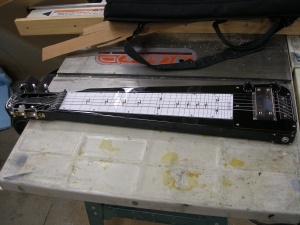 Typical lap steel string spread at the nut is about 1-31/32 and at the bridge 2-3/16″ compared to on a guitar 1-5/8 and 2-1/16. I painted the angle iron with black “Hammerite” which you can get at any paint store. 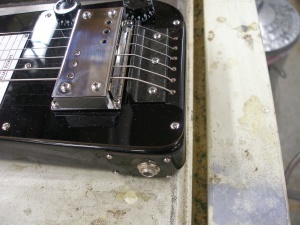 The bridge and nut were 9/16″ tall, so the Supro® pickup needed a 1/8″ shim to be in proper alignment. As you’ll see in this photo, I also modified the guitar by drilling holes all the way through the body and put string ferrules in the back. 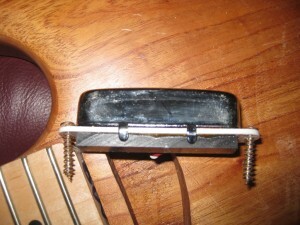 I also relocated the output jack to the side of the guitar rather than where it was originally located in the pickgaurd. This required a hole to be drilled for the jack and a new jack plate needed to be made. I also routed the pickup cavity out so I could mount a variety of pickups. This step is not necessary if you mount only the Supro®. In this photo you can see I made a new pickgaurd out of plastic. This turned out to be much easier than working with the original metal pickgaurd. I also replaced the fingerboard. This was not a necessary step. But I have the tools to do it, so I went ahead and put some lipstick on the pig – so to speak. The only snag was only two of the 4 mounting screws for the pickup actually bit into wood – the two mounting screws closest to the fingerboard are machine screws which I made two threaded holes in the pickgaurd for them to tighten up against because the screws were located over the route for the original pickup which was quite deep. The pickup is mounted plenty solid this way. 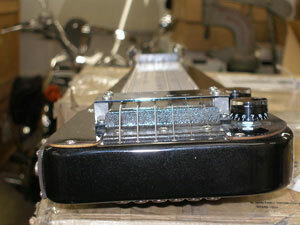 To learn more about the Lollar Supro® lap steel pickup, visit our web site. Supro®, and the “Supro Lightning Bolt design” are registered trademarks of Zinky Electronics, LLC. 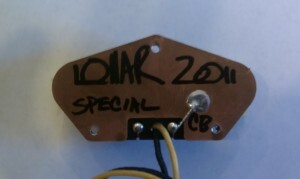 Lollar Supro style pickups are a limited production, under license of Supro USA. 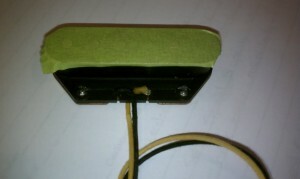 We are making a reproduction of the old Supro® / Valco / Oahu “string through” pickup. This pickup was originally used on a wide selection of different lap steel designs made by different makers and they were used on a few electric Spanish guitars (regular finger style guitars) like the Supro Ozark. 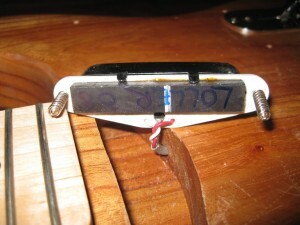 This type of pickup was also used on the first Ry Cooder “Coodercaster”. This pickup is unusually clear and detailed in tone for how much output it has. I have made the pickup the exact same size as the original with the exception of its bottom plate which I have made smaller so it will fit on a variety of guitars and the bridge is not built into the pickup like the originals. The pickup is meant to mount like any other typical guitar pickup rather than being part of the bridge and tailpiece like the originals are. 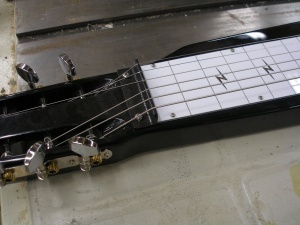 This pickup has two coils – one under the bottom three strings and one under the top three. The coils are wound so they dramatically reduce 60 cycle hum (humbucking) however the pickup still sounds like a single coil. In order for the pickup to work correctly and get good volume balance between the strings the coils are out of phase with each other- if we arranged the magnets so the coils were in phase with each other the pickup would give you bad string volume balance- some strings would be much louder than others so it’s the nature of the design that it works best with the coils out of phase with each other but because each coil senses different strings their phase doesn’t matter. 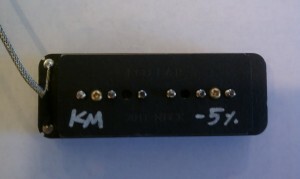 HOWEVER this DOES present a problem if you install this pickup into a guitar with more than one pickup. If you combine this pickup (typically installed in the bridge position) with a neck pickup or any other pickup in any position and you use both at once in combination half of the strings will be in phase and half will be out of phase. This is only a problem if you run two pickups at once. Installation requires a route approximately 1/8″ deep to allow room for the pole pieces and screws that hold the pickup top plate to the bottom. Lollar Supro spacer has a thickness of 1/8"
The pickup is shipped with a 1/8″ tall spacer that fits under the pickup that is routed for the pickup screws so combined with the spacer the pickup can be flush mounted on top of the guitar. A variety of spacer thicknesses are available if needed. They vary from 1-32″ to ¼” thick and can be used for mounting the pickup on a variety of guitars. 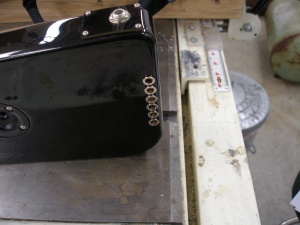 Most guitars with Gibson style bridges will need the pickup shimmed up to align with the strings properly. On Fender guitars the pickup will likely need mounted onto the surface of the pickgaurd. The strings run under the top metal plate so they sit between the top plate and the adjustable pole pieces. 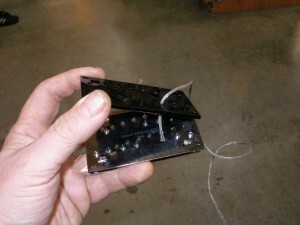 Ideally your strings will sit midway between the top plate and the pole piece. 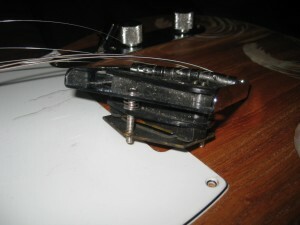 For a radiused set of strings (most guitars except lap steels) you will need to set the lowest and highest strings about midway between the top plate and the adjustable poles, your center strings will be closer to the top plate so you will need to raise the poles so the strings are equidistant between the plate and pole. It’s more important for the strings to line up with the pole pieces than on many other pickup designs, alignment and adjustment is almost critical. The pickup is also shipped with a routing diagram. 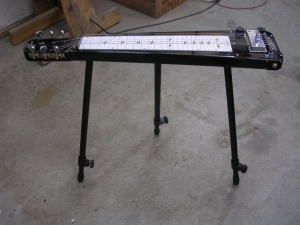 The next blog posting will describe how to modify an entry-level lap steel, and give you some tips on installing the Lollar Supro style pickup. Follow this link to learn even more about our Supro® lap steel pickup.